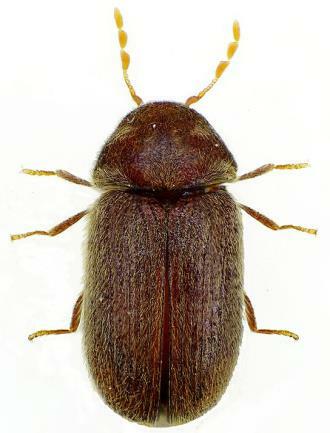 The Bread beetle, Stegobium paniceum, also known as the Biscuit beetle (or the Drugstore beetle in the U.S.A.) is one of the commonest pest insects of stored food. It is able to feed on a variety of plant and animal products including bread and flour and even hot spices and drugs. 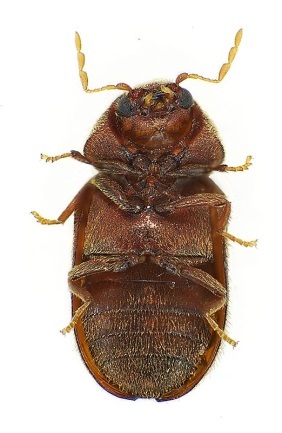 However, this beetle is not harmful to health and despite its close resemblance to the Common furniture beetle or Woodworm beetle (in the adult stage), it does not feed on wood. The adult beetles are usually noticed first. They are small, between 2 and 4 mm in length, reddish-brown and, under magnification, reveal fine grooves running lengthways along the wing cases. 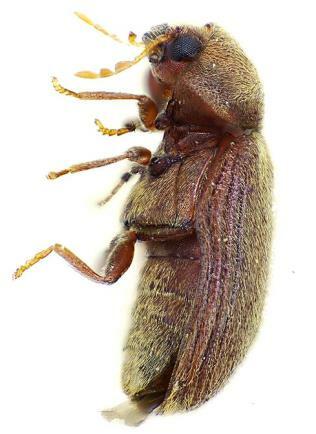 Furniture beetles (or Woodworms) are similar but are somewhat larger and darker and their antennae are shorter than the legs (in Bread beetles the lengths are similar). There are three flattened segments at the tip of antennae. The head is partially hidden by the pronotum (the plate that covers the upper part of the thorax). Biscuit beetles have large dark eyes. Photo credits: Siga / Wikimedia Commons. Line drawings © The Natural History Museum. 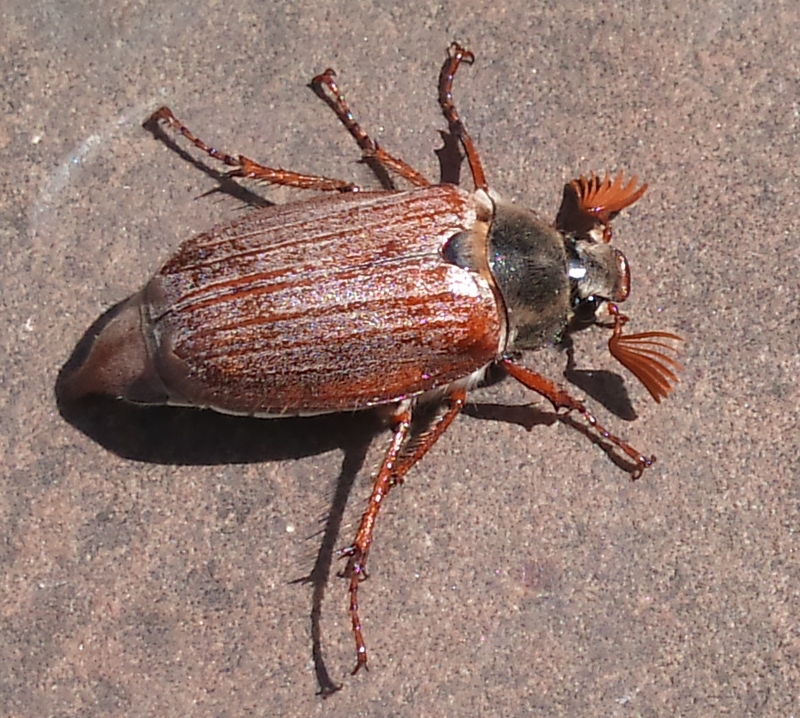 Somewhat larger and darker brown, antennae shorter than legs. Pronotum with obvious ‘hump’ like a monk’s cowl. Larvae bore into wood, where they feed for 3-5 years. Photo credits: Siga / Wikimedia Commons. Antennae with many serrations, while Biscuit beetle has three large ones at the tip. Has much weaker punctures on the surface of the wing covers (elytra). Eyes easier to see from above. Different shape of pronotum. 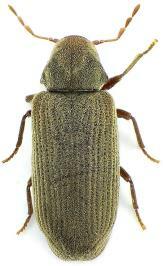 The Biscuit beetle occurs in houses, stores, warehouses and kitchens throughout central and northern Europe, including the UK, sometimes in very large numbers. It is known as a cosmopolitan species. In common with other beetles, this species passes through four life-stages: egg, larva, pupa and adult (pictured below). The speed of development through the life cycle depends on temperature, moisture, quality and abundance of food. In cool temperatures (below 15ºC) there is only one generation per year, in moderate temperatures two, while at higher temperatures (above 23ºC) there may be five or more. Eggs are laid by mated females on or near the foodstuff. When the larva emerges from the egg, it is less than 1mm in length. In its search for food, it may bite into packaged or hidden food sources. 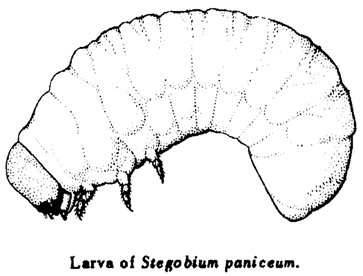 The larva increases in size and, at about 5mm in length, it enters the pupal stage. 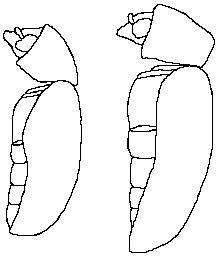 Before emergence as an adult beetle, a minimum of nine days is spent as the pupa in an oval shaped cell moulded by the larva using the food material. 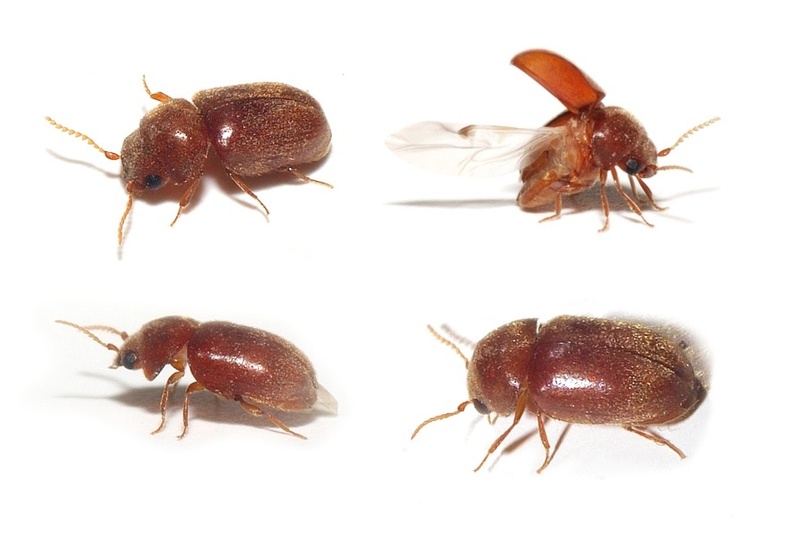 Because the Bread beetle larva thrives in dark, warm, undisturbed places, it is essential to search thoroughly for the food-source of the larva if adults are found wandering around. Rarely-used dried-foods such as flour or spices are often the source of an infestation. Removing disused and old foodstuff should eliminate an infestation. Adult beetles may be seen around fire-places and air vents with no apparent food-source available. These are likely to have come from nests of wasps or birds in the attic. Beware also of bread in fire-places that has been dropped down the chimney by birds. With suitable hygiene, and by preventing access into the attic by nest-builders, the successful eradication of this pest should be assured. Here in the identification service we don’t need a diary or calendar to know what time of year it is, in fact we don’t even have to look out of the window! We can tell the time of year by trends in the enquiries we get by email, phone, through the post or on our forum. Many species of insect have a lifecycle that lasts for a year, with the larvae or nymphs around in one season, and the adults around in another. Last year we blogged about the amazing bee fly and how it is a sure sign that spring is on the way, but it’s not the only enquiry with a strong seasonal distribution. I searched our database and the forum for enquiries right back through the mists of time to 1992 to collect data on 3 of our common seasonal species – bee flies (Bombylius sp. ), the excellently named cockchafer (Melolontha melolontha) and house spiders (Tegenaria sp.). On a more serious note this little project shows how the identification service records are a mine of fascinating and potentially useful information. This data also shows that both bee flies and cockchafers emerged significantly earlier in 2011 than 2010, so it would be interesting to see how they fare in 2012 – keep your enquiries and observations coming in to our forum! JB on Body of a bee, face of a mosquito - spring is in the air! Elz on Body of a bee, face of a mosquito - spring is in the air! Clare on Body of a bee, face of a mosquito - spring is in the air! Carol Wands on Body of a bee, face of a mosquito - spring is in the air! A.Rae on Body of a bee, face of a mosquito - spring is in the air! Body of a bee, face of a mosquito - spring is in the air! Rocks from space - have you found a meteorite? Re: What the hell is this?